He ends the sentence with a smile across his face. There was not that one specific moment for Petito, but many of them. Petito pushes students to think harder, study longer, and research smarter. All which brings out the best in them and creates an infinite vault of “aha” moments. Now as a professor in the Social and Behavioral Science department he strives to tie currents events into all the material he teaches. It can be a difficult task to teach current events in today’s tumultuous political climate. However, Petito takes on the task. He does not steer away from the uncomfortable topics. Petito challenges all students to voice their opinions in hopes of changing their outlook so that perhaps they will end up less divided. Petito spent his adolescent years hating the classroom. Textbooks and countless exams just never appealed to him. None of the facts and information he memorized seemed relevant to him. Now at age 72, Petito has been a professor at Bucks County Community College since 2004. He keeps his classroom lively. His hands move in every direction as he tries to emphasize important points while lecturing. He springs out of his chair to emphasize an idea a student made. He captures every student’s attention. Students come to class ready to share an article or news story that connects to what they have learned. Petito runs a classroom where the students are active participants. His teaching style was developed by understanding what students dislike the most about learning. Becoming an educator was not something he planned for but like many events in his life it just happened by chance. Petito had a privileged childhood. He grew up in Princeton, New Jersey. He is the son of an Italian immigrant who became a banker later in life. Petito evidently admires his father’s Italian roots and how hard he worked to become successful. Petito’s dad’s eight other siblings grew up in the not-as-lavish Trenton, New Jersey. “I got to see both sides,” he said. Petito described how he has always been more interested in those who were less fortunate than him, even though he attended a private school. He simply ran into a former dean of Bucks who mentioned that the school was in need of a history professor. After years of working one odd job and then another, Petito finally found a career that was truly special. 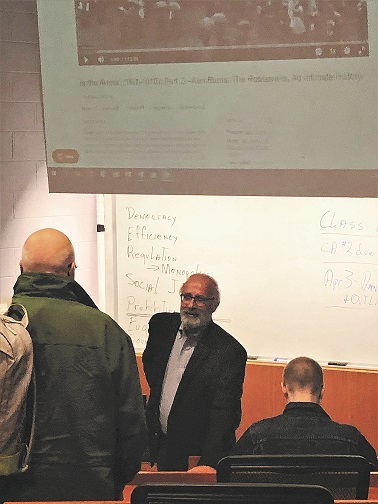 At Bucks, Petito teaches both history and political science courses, in a time when people are very politically divided. “I am up front about my political stance,” said Petitio. He wants to be able to challenge his students. There are certain topics in a political science course that are unavoidable. “The only way we are going to get out of this jam the country is to forget about party labels. Bipartisanism seems to be a desired goal for his vision of the country, and he can have a small impact on it happening by teaching it in the classroom. “If I have one strength it is making students feel comfortable in the class room,” said Petito. His inclusive classroom helps drive home the idea that working together accomplishes more than keeping a closed mind. Petito never makes a student feel ostracized for having a different opinion. After jumping from career to career Petito found one constant in his life, that it is impossible to plan anything. Even though teaching may have not been what he had also envisioned for himself it is clear this is where he is supposed to be.